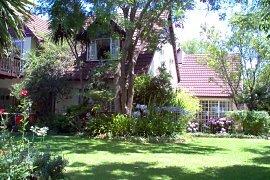 A warm welcome, a good nights sleep and a delicious English breakfast awaits you at Pepperwood Lodge. Relax in the garden under big pecan nut trees, take a dip in the sparkling pool or just enjoy the abundant bird life. Pepperwood is situated in northern Randburg bordering on Sandton, close to the Dome, Northgate, Fourways and Monte Casino, as well as Sandton City. Our guests are given their own electronic access and the cars are parked under lights behind electric gates all night. We have a high priority on security. Our rooms are spacious and comfortable some with their own dining rooms for privacy. Eat in your pyjamas if you like. All the rooms have bar fridges, fans, heating, DStv & M-Net, and have their own bathrooms. We have a dedicated line in our office for you to plug in your lap top and download your email. Each room is different, we have single, double and family accommodation to meet your needs, your home from home. Our accommodation is ideal for corporates and tourists. Pepperwood is close to many excellent restaurants, the choice is yours - or eat in if you prefer we have a really good home cooking. We have the best taxi service for airport transfers & around town shuttles, best prices. Our tour guide is not to be beaten, he is highly qualified and will show you the best of Johannesburg , Soweto, Lesidi village, Gold Reef city, Cullinan Diamond mine, Pretoria, Sun City, the Pilansburg Game Reserve, Lion & Rhino park, The Cradle of mankind and much more. Need to exercise? We are close to well known gyms. If golf is your bag, enjoy a game at one of the local courses or take a 35 minute drive to the famous Pecanwood course on the Hartebeespoort dam. A highly recommended beautician is available, on-call, for your beauty needs when preparing for that wedding you are staying overnight for. We have a vast collection of Anglo-Boer war memorabilia, a library for your enjoyment, and an enthusiast who will happily arrange tours and talks on the subject.